(Tokyo-YeonHap News) Correspondent Lee TaeMun = Recently this March 16th at the Tokyo's Nakano Sun Plaza Hall, ‘K-Rookies Party Vol.1’ was held. This party was planned to showcase the talented K-pop rookies to receive cheers from their Japanese fans. 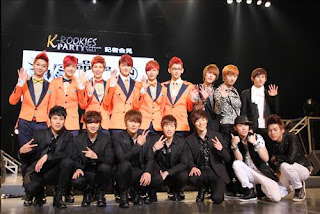 The first event invited the dance group N-Sonic, the vocal group CODE-V, and the 6-membered band Led apple to take on the stage with their hit songs. N-Sonic performed their debut song ‘Super Boy’ equipped with a powerful choreography, as well as ‘I won’t Let Go’, ‘Bye Bye Bye’ which set up the atmosphere. The members also performed some dance numbers. The 5-membered group CODE-V who are going to have their japanese debut on May performed their hit songs ‘Miracle’, ‘Honestly’, and their Japanese debut song ‘Addiction’. The fans were captivated by their acapella performance. First time performing in Japan, Led apple received hot response from the fans. They performed ‘Time Is Up’ as well as ‘Someone Met By Chance’, ‘Hope’, and ‘How Dare You’ which impressed the fans. During the press conference, the groups were asked what they charms were, CODE-V said, “All the members are in-charge of vocals, making beautiful harmony”, Led apple said, “We are a dance band that is both fun to watch and listen to”, and N-Sonic said, “We are always new with every song”.